Your company knows its business. Let us help you prove it. 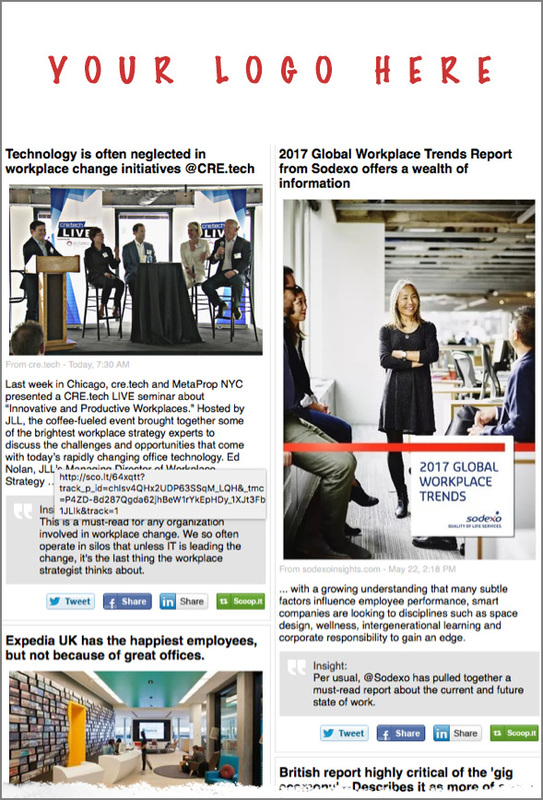 Curated daily, all the facts and workplace strategy developments from around the world are delivered to you for re-distribution monthly. And we can add the material to your social feeds, too. We find breaking news, industry insights, academic research, and popular press stories that put your readers ahead of the crowd. It’s arranged in an easily digestible format that you can quickly email to prospects, customers, and colleagues. And we can post the same material directly to your social feeds so you save time and money, too. The news you share is relevant, useful, and unbiased, or we won’t send it. A select group of ‘in the know’ sponsors will receive our curated newsfeed to circulate to their associates, prospects, and clients. Everyone gets your message and shares the cost, no one gets your list. You gain the attention of people who matter. Customers and prospects will look forward to receiving your email and will invest time reading it. Sorting through the noise for what’s new, important, and insightful can be a lot of work. In fact, it’s our full-time job. Why should you do it too? We’ll send you the first monthly issues free, and you resend it to your list. If you like what you read and want to keep sending it to your team, customers, and prospects, sponsorship is $1,000 a month or $5000 as an exclusive product. Your logo and brand will be seen by all the readers and your list stays private, but you benefit from circulation to all sponsor’s lists. If you want your message heard, you need to offer something valuable, something that will save readers time and help them make money. And you will, we make sure of it. Imagine your customers and prospects looking forward to receiving your email, and making time to read it. They will! Efficiently and quickly improve your brand leadership. Publish compelling content that attracts the right audience and builds brand awareness. Build trust by becoming the go-to resource in your industry. Publish consistently. Keep your name in your reader’s mind.